If there is only one dzong you get to see in the Thunder Dragon Kingdom, let it be the Punakha Dzong, or the Pungtang Dechen Photrang Dzong built by Ngawang Namgyal (1594–1651), 1st Zhabdrung Rinpoche [Great Lama] and founder of the Bhutanese State. A recurring figure in Bhutanese spiritual iconography, both painting and sculpture, Zhabdrung Ngawang Namgyal was a Drukpa Lineage [Red Hat Sect] lama from Tibet and responsible for unifying the warring valley kingdoms under single rule. Soon after his death, however, the country broke into warring factions once again. Despite this, together with Gautama Buddha and Padmasambhava, he is omnipresent. I saw him at every lhakhang, every dzong, and yes, even on most tangkhas, throughout the country, worshipped by the Bhutanese with much faith. Padmasambhava, for your reference, is the 8th Century Indian Buddhist master credited with introducing Tantric Buddhism to Tibet and, thereafter, Bhutan. Punakha Dzong was Zhabdrung Ngawang Namgyal, along with his 600 monks’, home when he was alive. On his death, his mummified body was enshrined here and is kept in the Machey Lhakhang, a temple which can be visited only by the two guardian lamas, the king and chief abbot. Surrounded with blooming lilac jacarandas in spring, the towering edifice is a joy to behold. Home of sacred and secular Bhutan, not much has changed here since 1637. The second oldest and second largest in the country, Punakha Dzong was destroyed countless times through history by fire, an earthquake and a flood. Each time, the Bhutanese people rebuilt it to the original lines Zhabdrung Ngawang Namgyal built it as. Made of earth, stone, and timber, the dzong is one of 16 built by him during his rule and measures 180 metres in length and 72 metres in width. Three docheys [courtyards] and a central 6-storeyed tower [utse], both replete with intricate carved wooden frames painted in red, gold, and black, and whitewashed walls create a symphony of beauty and harmony. It is almost ethereal in form and style. When a red-robed monk wafts through, deep in thought, it is hard put to remind myself of the capitalist world I live in. 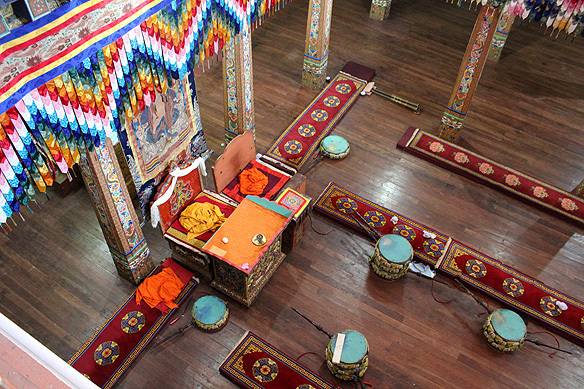 The Kuenrey or Congregation Hall, at its far-end, is the highlight of the dzong. Yes, a highlight also has a highlight! 🙂 Inside, mammoth effigies of Buddha, flanked by Guru Rinpoche [Padmasambhava] and Zhabdrung Ngawang Namgyal, soar towards the ceiling. A riot of colour reveals hundreds of painted dragons on the latter whilst the 12 episodes of Buddha’s life are narrated on the walls. I sit down cross-legged on the floor and have a little chat with my god. Thank you’s are in order, wouldn’t you agree. My prayer, however, is punctuated with the devouring glances I cast around me. How do you recognize Zhabdrung Ngawang Namgyal? He is the seated figure with a crown and beard in Bhutanese iconography. 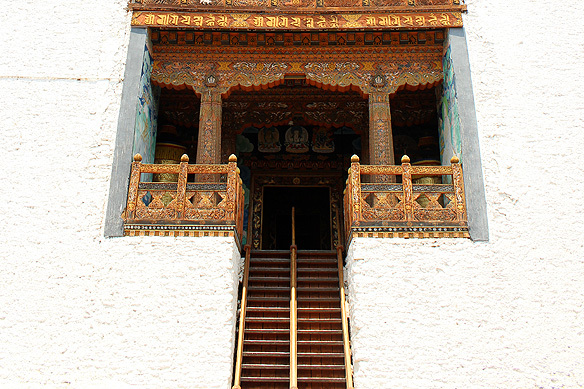 Within the massive doors of Punakha Dzong, but slightly away from the main buildings is the Dzong Chug or Small Dzong. The older of the dzongs, it houses the “talking Buddha”. 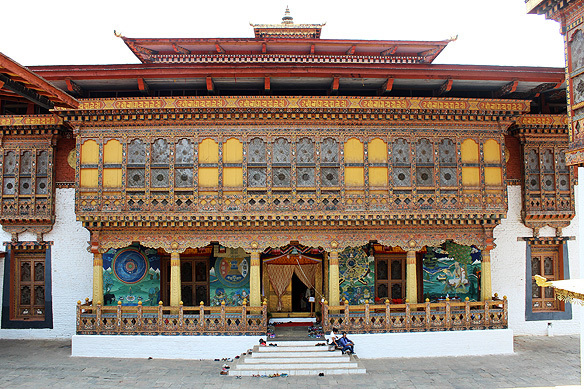 According to legend, Zhabdrung Ngawang Namgyal ordered his architect Zowe Palep to sleep one night at this dzong. As he slept, the great lama took him in his dreams to the Palace of Guru Rinpoche where Palep conceived the design of the Palace of Happiness. “Ask. Buddha will give,” he beams. “But I don’t want anything [at least not right now],” I assure him, feeling rather content amidst my current surrounds. “Ok, but he will still give,” he tells me with a grin. The Punakha Dzong was the administrative seat of Bhutan’s government till 1955. When the capital shifted to Thimphu it became the winter seat of the chief abbot. The first king of Bhutan, Ugyen Wangchuck, was crowned here in 1907. The current king was married here in 2011. And like me, numerous others make the journey to gasp in joy at the dzong’s loveliness every year and wander through the jacaranda petals that carpet the green. 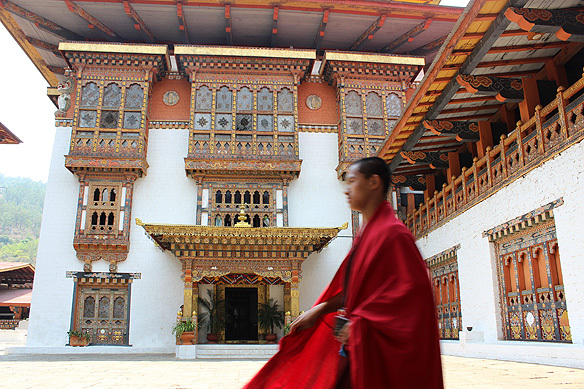 Visitors are only allowed in the summer months when the chief abbot moves to Thimphu with his entourage. Caps, shorts, or sleeveless attire is not allowed inside. 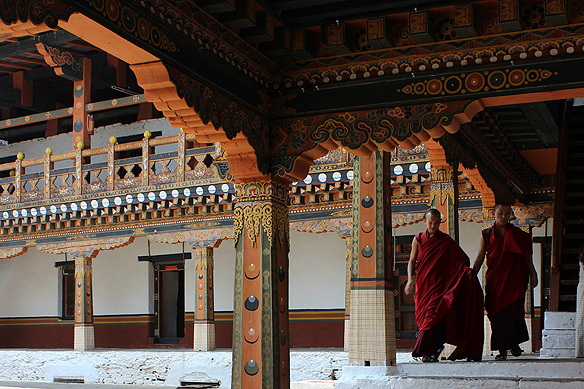 Photography is allowed inside the dzong but not in the temples. You need to remove your shoes when entering a temple. Punakha Drubchen is an annual festival held in the dzong in spring, introduced by Zhabdrung Ngawang Namgyal. A spectacular event, it recreates a scene from the 17th century battle he led and won against the Tibetan army. This entry was posted in Bhutan, Exploring our World and tagged 1st Zhabdrung Rinpoche, Bhutanese Festivals, Founder of Bhutanese State, Kuenrey, Machey Lhakhang, Most Beautiful Dzong in Bhutan, Padmasambhava, Punakha Cantilever Bridge, Punakha Dzong, Red Hat Sect, Tantric Buddhism by Rama Arya. Bookmark the permalink. Thank you Rama…. 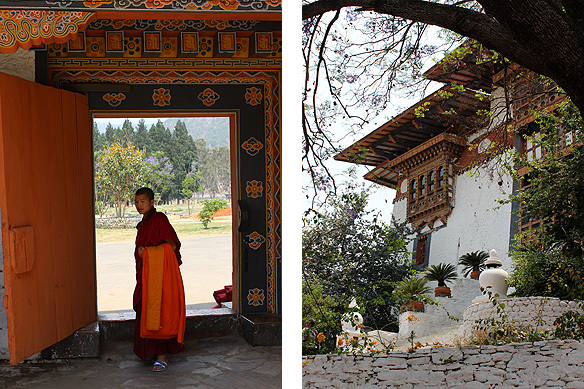 your blog took me back to our visit to beautiful Punakha Dzong. 🙂 Glad you enjoyed reading it.